SALT LAKE CITY--(BUSINESS WIRE)--As part of the celebration of the 50th Anniversary of “Star Trek: The Original Series,” Salt Lake Comic Con is transporting one of the top stars of the groundbreaking show, Lieutenant Hikaru Sulu, to Salt Lake Comic Con FanXperience 2016. 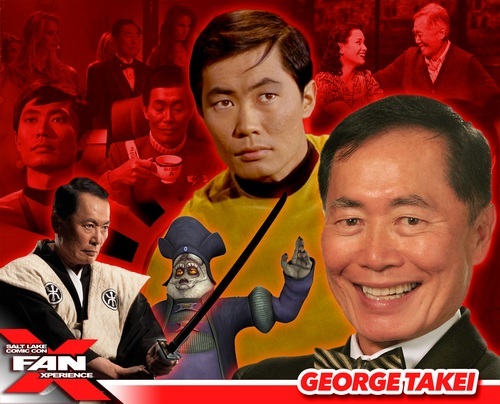 Actor, activist and social media star George Takei is a great addition to a long list of celebrity guests scheduled to appear at FanX™ 2016. Salt Lake Comic Con organizers also revealed additional celebrity guest Peter Facinelli, one of the principal characters of The Twilight Saga film series, who will attend FanX™ 2016. FanX™ 2016 takes place March 24-26, 2016, at the Salt Palace Convention Center. The event is produced by the same team behind Salt Lake Comic Con, which quickly established itself as one of the premier pop culture events in the country and the most attended convention in the history of Utah. Takei is widely known for his role as Hikaru Sulu, helmsman of the USS Enterprise in the television series “Star Trek.” He also portrayed the character in six “Star Trek” feature films. But his fame came later as he took social media by storm and became one of the most successful stars of Facebook with almost 10 million followers reaching up to 100 million people in a week. Takei is a proponent of LGBT rights, active in state and local politics, and has won several awards and accolades for his work on human rights. He has also been inducted into the Hollywood Walk of Fame with a star on Hollywood Boulevard. Other FanX 2016 guests include Gillian Anderson, Norman Reedus, Matt Smith, Buzz Aldrin, Summer Glau, Jason Isaacs, Tom Kenny and more. The third annual FanX™ is an exclusive event for Salt Lake Comic Con fans designed to give attendees an up close and personal FanXperience with their favorite pop culture icons. In addition to celebrity guests, FanX will feature comicbook artists and creators, authors, panelists, and more. There are more celebrity guests and panel programming per square feet than the bigger event in the fall, with over 400 guests and panelists at this event. FanX strays from a comic book focus, bringing real heroes like Buzz Aldrin, the second man to walk on the moon. FanX™ 2016 is the first event of the year, with Salt Lake Comic Con 2016 scheduled for September. Both events feature incredible FanXperiences. Celebrity Stars pose for photo ops and sign autographs for fans, as well as share stories and answer questions at a Spotlight Panel. Hundreds of hours of Panels will take place over the weekend which cover a wide range of pop culture topics. The Vendor Hall features hundreds of booths selling collectibles, clothes, exclusives, and other geeky merchandise. Famous authors and artists will also be on hand to meet fans and sell prints and books they will personally sign. The youngest fans will find a place to meet kid-favorite characters, participate in family-friendly activities, and make arts and crafts in the KidCon section of the event. There will also be other Special Events scheduled over the weekend, including parties, nightlife, exclusive paid panels, meet-and-greets and more. For more information about FanX™ 2016 or to buy tickets, visit the Salt Lake Comic Con website at http://saltlakecomiccon.com/. Learn more about what there is to see and do at the event by visiting http://saltlakecomiccon.com/fanx-xperiences/. Salt Lake Comic Con and Salt Lake Comic Con FanX™ are organized by Dan Farr Productions and is not associated with any other comic con. Salt Lake Comic Con is the most attended convention in the history of Utah and the largest comic con in the world per capita. FanXperience is the ‘Ultimate Fan Celebration’. DFP is an event and marketing group devoted to organizing events, launching and acquiring new shows, and partnering with premium celebrities and brands in the pop culture arena. DFP is dedicated to producing spectacular celebrations of popular culture that lead the market in providing exceptional and rewarding experiences for our consumers, fans, celebrity guests, vendors and partners. Find out more at: www.SaltLakeComicCon.com.